It’s Just Becoming Weird, Isn’t It? 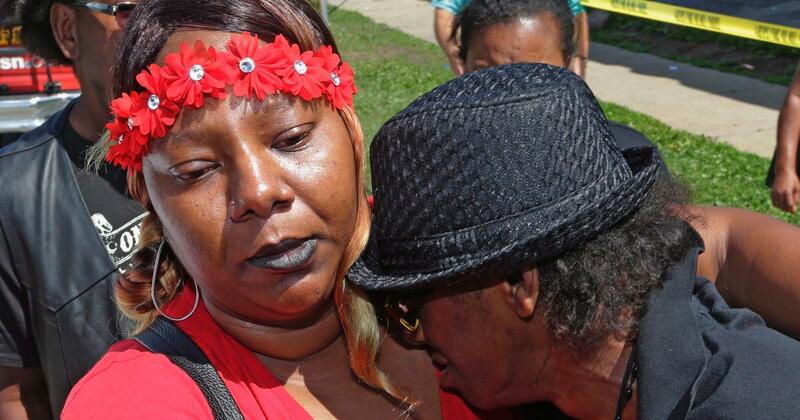 Slain Sylville Smith’s father mourns the loss of his son. The world continues to turn and that’s a good thing. If it stopped, we’d all be in trouble. But what we’re seeing in this world is not a pretty sight. I’m constantly amazed at the cries of racism by people who earnestly believe that law enforcement officials are out to hunt people of color. Granted, there are rogue cops out there to be sure. Some of them have been fired and/or have gone to prison for their crimes. Some still work as police officers, unfortunately, and that puts a black mark on every cop because of it. But this growing sense of increasing racism in society is being fomented by people who keep themselves separate from the fray. The backers, the people funding specific groups like “Black Lives Matter” (BLM) remain safely out of harms way while the puppets in their engineered groups direct and guide others who create the mayhem and havoc. In the case of the most recent situation, due to the fatal shooting of armed felon Sylville Smith in Milwaukee, WI, communist groups have joined the fray. This may be why there was a second day/night of tensions, rioting, and looting in the city. While I can understand – to a point – the loss a parent must feel when their child is killed, in the case of Sylville Smith’s father, he fails to grasp the fact that his son would be alive today had he simply followed instructions. The fact that he had a weapon loaded with 21 rounds of ammo as a felon, immediately put him at odds with the law. He simply made things worse by running and refusing to drop his weapon. Where was this father when his son was being raised? I’m getting very tired of seeing grieving parents used as images of brainwashing by the digital media and no one asks the hard questions. Where were they when their child was growing up? Why didn’t they teach their child right and wrong? Why should society be expected to hail these slain criminals as heroes when they would probably be alive today had they simply obeyed police or better yet, chosen a path other than criminal enterprise to pursue? These parents perpetrate lies that are supposed to make us believe their child was an innocent, when the exact opposite is the case. They were killed because of the trouble they caused for themselves and they are very much aware of that truth as they sit in eternity waiting for official judgment to fall. They know beyond all doubt that they, and they alone, chose poorly. Their poor choices put them where they are now; in hell, waiting to be moved into the Lake of Fire once officially judged at the Great White Throne (Revelation 20:11). It could’ve been avoided. But the fact remains that this type of image, intended to tug at the heartstrings of society, is broadcast repeatedly by news bureaus whose goal it is to change the way society views black criminals who are shot and killed by cops. The intended outcome is that people will believe that under no circumstances should a black person be shot by a cop, even when that black person poses a direct threat to law enforcement. The ensuing riots and looting are designed to underscore that narrative. We have criminals involved in illegal activity killed by police, followed by others from the black community involving themselves in illegal activities of looting, rioting, and assault on truly innocent people. But as much as illegal activity of this kind bothers me, what bothers more is the way people think about these situations and life in general. I have a page on a social network site where I post political articles. There are those who come to that page to argue that cops are hunting blacks so they can gun them down. Never mind that in the cases of Mike Brown, Sylville Smith, and many others, the suspects were armed (or in the case of Brown, tried to take Officer Wilson’s gun, punched him in the face, then ultimately ran full speed at him), had previous run-ins with the law, and were simply not obeying the orders given by police. In the case of Sylville Smith, the other suspect who was with him when police stopped the car was simply arrested without incident. That could have happened to Smith as well, but he chose a different path and because of it, he is now in eternity where things are extremely clear. There is no lying there, there is no inability to accept truth. Truth is the only available option in eternity. By the way, the officer who shot and killed Smith was also African-American, but there are those who would accuse him of being an “Uncle Tom,” given over to white supremacists. In another example, a young black woman set out to “prove” that cops are racist and hunting blacks. How did she do this? By loading her shotgun and creating a situation where she faced down police officers. During that stand-off, she used her young son as a shield. By the way, she also had a live-in boyfriend who is an alleged felon. If that’s the case, then there should have been no gun of any kind available to this young woman because she was in the same house with the felon. But laws do not matter to too many today. Nonetheless, during the stand-off with police, the young woman was killed. Her child was physically unhurt, but will probably suffer years of mental anguish from the ordeal, not to mention her attempts to brainwash her young son into thinking that police were hunting blacks (from other videos she recorded). The tragedy here is that she also is now in eternity where truth is the only option. There are no excuses. She now, very clearly, understands the truth surrounding her life and she now knows how many times she lied to herself and her young son. She is acutely aware of the fact that she lived outside the rule of law. She may have done so because she had lied enough times to herself about cops wanting to kill blacks or she simply started lying to herself because it conveniently gave her an excuse to act as she acted. Ultimately, regardless of the scenario, she is fully and completely aware of those lies and that they were lies. She will spend the rest of eternity acutely aware of all the lies she chose to believe and wishing she could have a “do-over.” I’m sure Sylville Smith believes the same thing as does Mike Brown. But it is too late for them. What I’m getting at is that I am appalled at how many people appear to have fallen prey to a huge delusion that has caused them to believe lies (similar to what we read in 2 Thessalonians 2:11). This is the most troubling aspect of where society is today and it’s not merely with people who believe the lies regarding Black Lives Matter. People so willingly and easily grab onto and adopt lies that allow them to believe that they are victims. In the wake of the young woman’s cop by suicide mentioned above, her friends intoned that they must never let her “sacrifice” fall through the cracks. She must be remembered as a heroine. What kind of thinking prompts people to take their lives by forcing men and women with badges to fatally shoot them? What kind of people after hearing of that incident believe the person who was fatally killed was actually a brave soul and must be remembered for her alleged act of bravery? The world appears to be going crazy, following the path leading to tyranny with gusto. Tyranny in greater measure is on its way to America and other parts of what has always been the civilized world. There seems little that can be done to stop it. Though we are not yet at the point of 2 Thessalonians 2:11, it is very clear that things are moving to that point. People are being prepped and their defenses broken down so that they will more easily believe the lies when the Antichrist arrives on the scene. I believe this is what we are seeing in society; a break-down of resistance against lies so that people more willingly accept them. This is taking society by storm as more and more people give themselves over to lies perpetrated by people who are paving the way for the coming Antichrist (whether they know it or not). As I noted in three articles related to Neil Postman’s book, Amusing Ourselves to Death, the pattern has been established that has made it very hard for people to reject lies. The lies become believable because they stroke a person’s emotional egos and desire for recognition. People are easily brainwashed today because they’ve been in the process of being molded by the digital media for decades. It’s all coming home to roost now in society, which has given up on truth, preferring lies instead. I sit and I consider these things and I am dumbfounded. I see people who cannot think critically. They cannot remove themselves from the lies and it is largely due to the fact that they do not wish to do so. The lies make them feel important. The lies give them permission to be the victim. The lies tell them that if they die “for the cause,” that will be the victory they seek. This applies to people who simply accept all forms of lies, whether the lie is that God doesn’t exist, that all people go to heaven, or anything else that captures a person’s heart, soul, and mind, but ends up being a lie. It is amazing to watch seemingly intelligent people place such a high value on acting, as a for instance, or singing, or some other form of entertainment. In the end, it is all self-aggrandizing and puts the person on the pedestal. Too often today, people place too high a value on themselves in the wrong area. While God loves all and wants no one to perish, too many people lack the humility to see that they have a true need for salvation. The lies they hold to keep them from seeing that need. There are many forms of blindness and whether it’s believing the lies of Black Lives Matters or thinking more highly of self than a person should, all of it keeps people from seeing the truth. The only truth that matters is that all have sinned and fallen short (Romans 3:23), and without salvation made possible by the life, death, and resurrection of Jesus, there is no hope for anyone. That is truth, but all too often rejected, leaving people to find and pursue their own version of truth, which in reality, is simply a diversion away from God and eternal life. For most, this is where their lives lead, though they cannot see it because of the lies they have embraced. It is so sad to see that this is where society is today. Believing lies has become the norm for too many. Short of God opening their eyes, nothing can be done for them. They are hopelessly lost, yet even so, we must continue to pray because as Paul tells us, the battle rages in the heavenly realms. For our struggle is not against flesh and blood, but against the rulers, against the powers, against the world rulers of this darkness, against the spiritual forces of evil in the heavens (Ephesians 6:12; NET). It may well appear that the war is raging in Milwaukee and other places in the world. In reality, it is simply spilling over from the spiritual realm. If there was no war there, there would be no war here on earth. The last few weeks, my soul has grown weary. I find myself simply saddened at the chosen fate of too many today. They cannot listen to reason because they cannot reason. They are spiritually dead in their sins and cannot extricate themselves. Instead of being able to make good and right decisions, they continue to make decisions that place them deeper and deeper inside the lies that surround them and carry them along. Those lies, seen as truth, continue to guide them away from God in Christ. There is a very real, helpless feeling within as the awareness dawns that wide is path that leads to destruction and many will find it (cf. Matthew 7:13-14). Watching people embrace lie after lie to their own (and society’s), detriment is appallingly scary. It is very much like watching people march toward a burning building and there is nothing you can do to move them off their course except repeatedly tell them what is ahead. We must do that and most, unfortunately, will reject that simple truth. 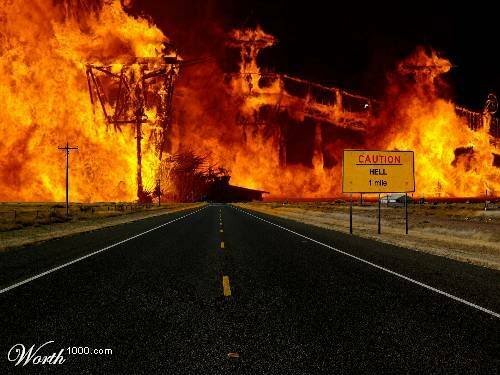 They will stumble on ahead, with purpose, entering the burning structure that they cannot see until it is way too late. To me, there is absolutely nothing more frightening than that. Entry filed under: Agenda 21, Atheism and religion, christianity, Cultural Marxism, Emotional virtue, Religious - Christian - Prophecy. Tags: black lives matter, communist, law enforcement, looting, matthew 7:13-14, mike brown, milwaukee riots, racial unrest, racism, rioting, sylville smith. Let us, as His obedient followers, not despair over the ultimate fate of the “many”, in Jesus’ absolutely true words who by procrastinating or default or choice will face His judgment and eternal condemnation. Instead let us faithfully perform our divinely appointed commissions to add to the “few” in planting salvation seeds hoping and praying that some will sprout and bear fruit, if not immediately then before death.